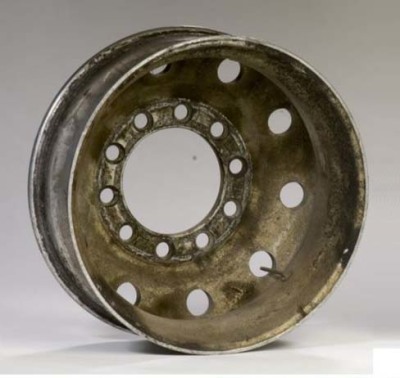 In comparison with alloy wheel from regular passenger cars, the truck wheels are much larger in diameter, much deeper in depth and much heavier in mass. 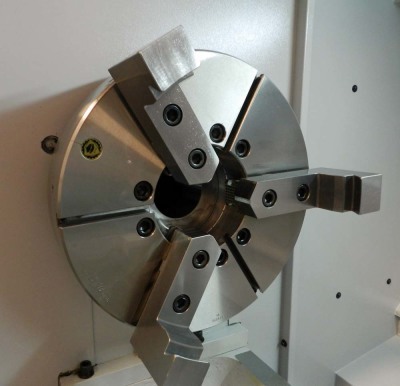 And their profiles are extended in both X-axis and Z-axis, which can be challenging for regular alloy wheel diamond cut CNC machines. 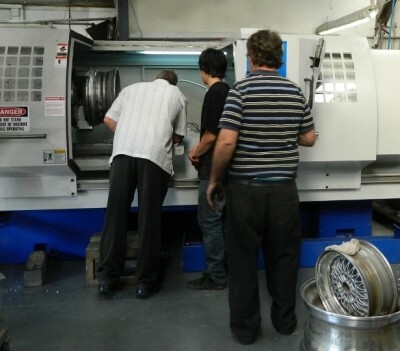 One Lehigh Diamond Cut Wheel Repair CNC lathe is delivered to a wheel shop specialized in truck wheel repair service. 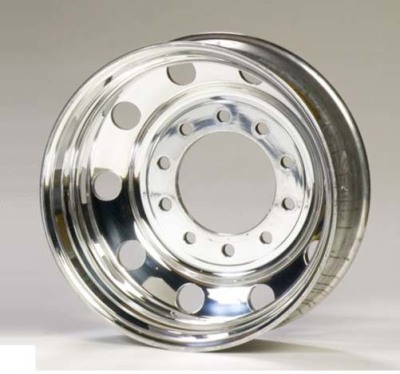 Typical alloy truck wheels are much larger in diameter, deeper in depth and heavier in mass. And their profiles are extended in both X-axis and Z-axis. Heavy duty casting bed to absorb cutting forces and dampen vibrations. Extra wide bed ways to provide maximum stability and very long travels. A. The headstock is manufactured from thick wall and heavily rigged casting to provide a smooth and quiet turning CNC lathe in order to become continuous working machine for many years operation. 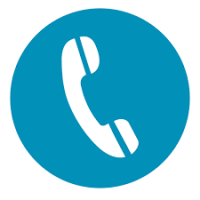 ​B. 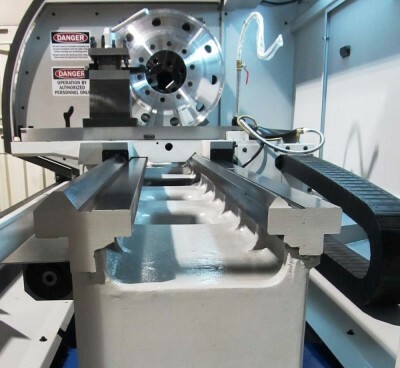 Super heavy duty casting bed to absorb cutting forces and dampen vibrations. Extra wide bed ways to provide maximum stability and very long travels. Bison super heavy duty 20” 3-jaw chuck with forged steel body as shown above. A large truck wheel is installed and secured with Bison chuck and soft jaw set for Lehigh Hi-Tech diamond cut Truck Wheel CNC lathe. Digitizing process for truck wheel with Lehigh diamond cut truck wheel machine. 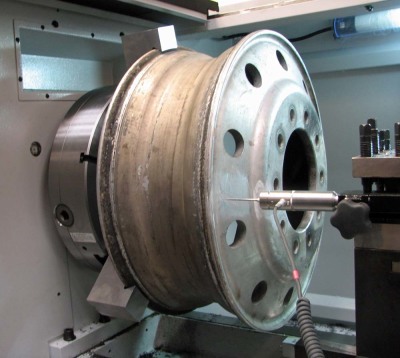 The diamond cut is taking place for this old truck wheel with Lehigh Hi-Tech Truck Wheel Repair CNC lathe machine. 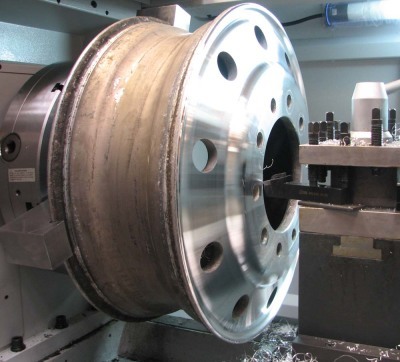 This is a truck wheel BEFORE it was diamond cut on Lehigh Hi-Tech truck wheel CNC lathe machine. The same truck wheel AFTER it was diamond cut on Lehigh Hi-Tech truck wheel CNC lathe machine. 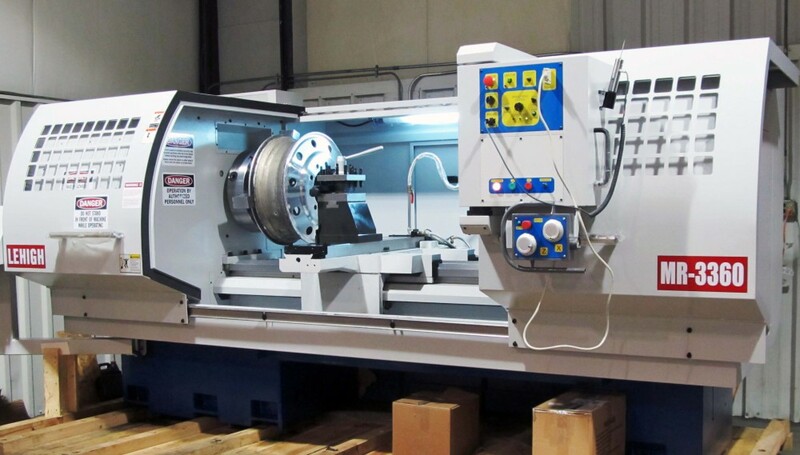 heavy duty Bison-America Brand (www.Bison-America.com) 20” 3-jaw chuck with forged steel body is installed on Lehigh Hi-Tech Truck Wheel Repair CNC lathe, with matched soft jaw sets to secure large truck alloy wheels in various dimensions. 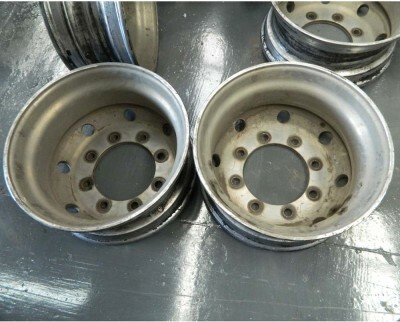 D. In terms of software design for alloy wheel digitizing and refinishing process, special consideration has been given for the truck wheel due to its profile characteristics extended with both X-axis and Z-axis. In general, we consider “Normal” digitizing as the process when the probe is moving along X-axis which works for most automobile rim profiles. For truck wheels, however, the normal digitizing is NOT workable along the side of the wheel barrel. 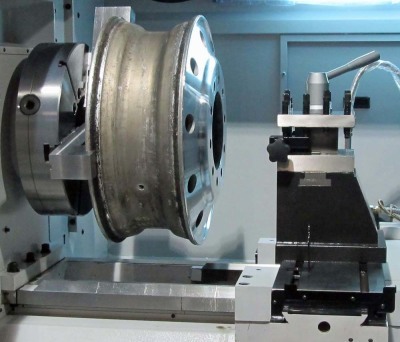 Therefore, “Side” digitizing is provided to overcome this problem for truck wheels from Lehigh Hi-Tech Truck Wheel Repair CNC lathe machines. This “Side” digitizing is allowing the probe moving straight along Z-axis from bottom of the truck wheel coming up to the lip area. The operator can easily switch from Normal digitizing process onto Side digitizing process by touch-select the Icons on the screen from this state of the art Lehigh Hi-Tech Truck Wheel Repair CNC lathe machine.